Happy Monday! I hope you had a wonderful weekend. We saw Moonrise Kingdom on Saturday… you guys, it was SO CUTE! And the sound track was just perfect. I spent all day Sunday running errands, lounging, baking, and catching up on my guilty pleasure (Housewives of wherever….I know…I know…don’t judge!). Today, I’m bringing you the first part of a little mini series I’m calling- ONE RECIPE, THREE WAYS: Roasted Strawberries. As you may have gathered from the title, I’ll be sharing three recipes that use roasted strawberries. 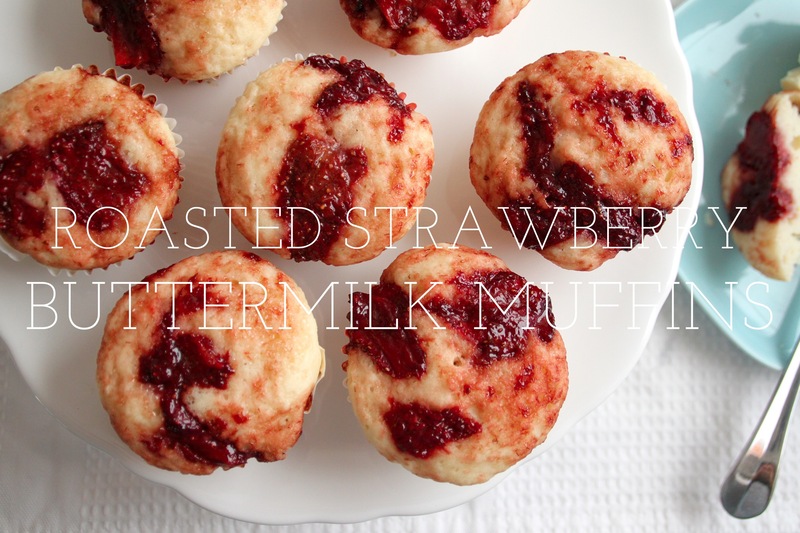 First up is Roasted Strawberry Buttermilk Muffins. They’re light, subtly sweet and simply delicious. The roasted strawberries add a rich tartness and a beautiful color. I ate one warm out of the oven with a little pat of butter…sooo good!! On Wednesday, I’ll be sharing the next installment of this mini series. Hope to see you then! xoxo! Place a rack in the center of the oven and preheat oven to 375 degrees F.
Line a rimmed baking sheet with parchment paper. 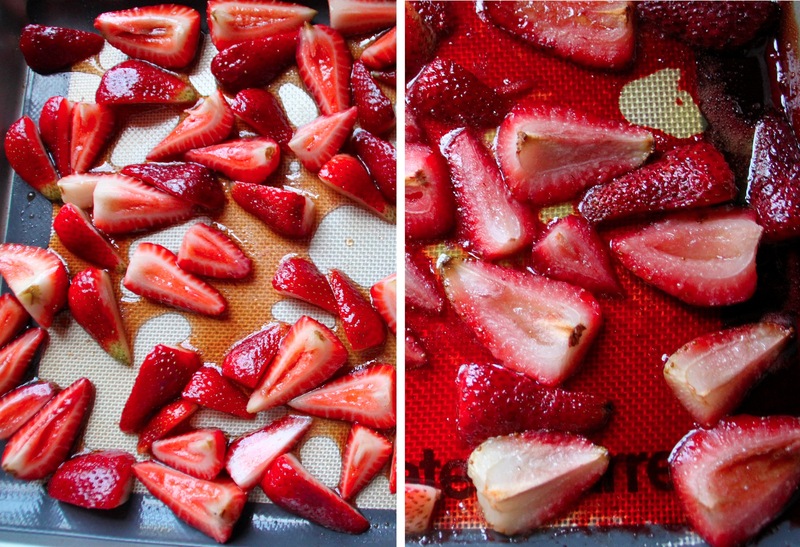 The strawberries get juicy, so a rimmed baking sheet is important. Set aside. Place a rack in the center of the oven and heat oven to 400 degrees F. Line a regular sized muffin tin with cupcake liners or butter well and forego any paper liner. In a medium bowl, whisk together flour, baking powder, salt and sugar. Set aside. In a small bowl, whisk together buttermilk, eggs, and butter. Whisk in the vanilla or almond extract. Add the buttermilk mixture all at once to the dry ingredients. Stir until just combined and no lumps remain. Spoon batter into the prepared muffin pan. 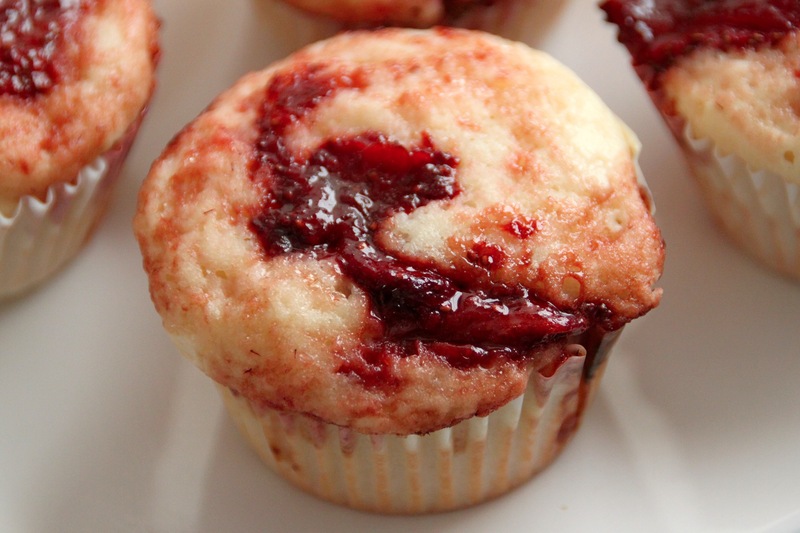 Top batter with roasted strawberries and juice, divided evenly among muffins. Sprinkle generously with turbinado sugar. 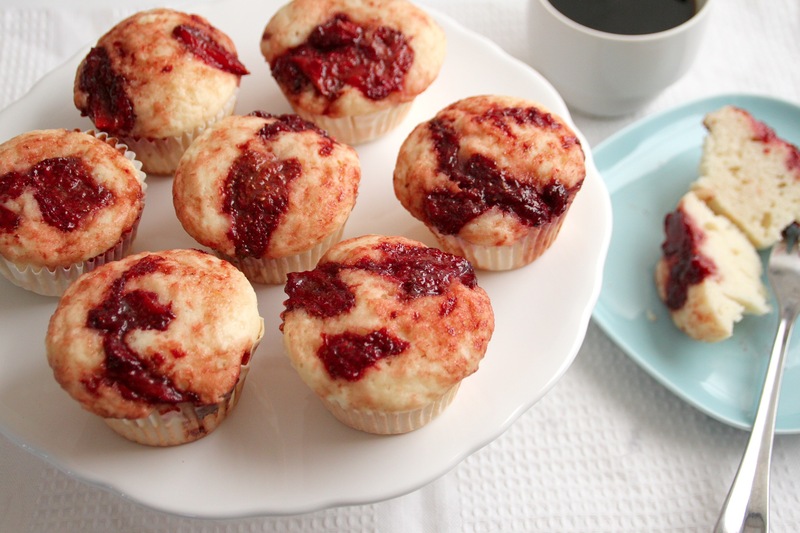 Bake for 15-20 minutes, or until a skewer inserted in the center of the muffins come out clean. Allow muffins to cool to room temperature. ENJOY! These look so delicious… I’m drooling! Thanks! They’re pretty darn good. Very subtle in flavor, but so tasty! 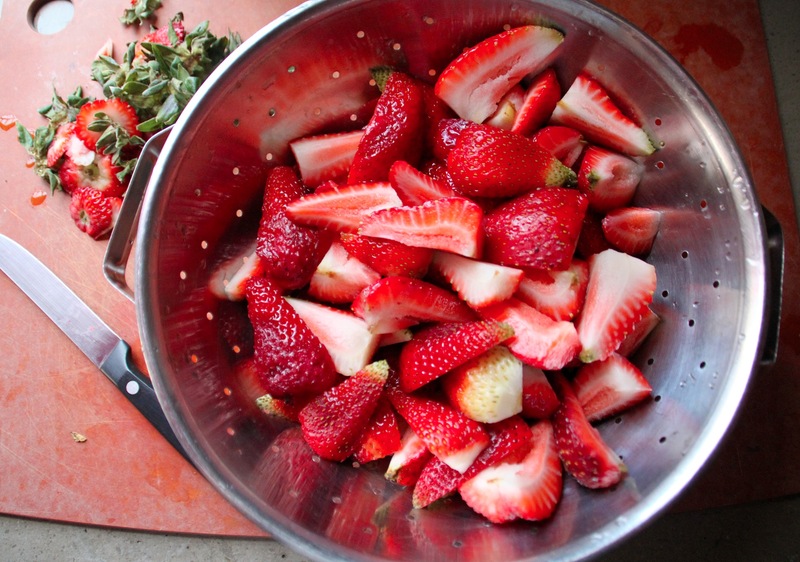 I just roasted strawberries for the first time…life altering. Thanks for sharing this recipe, I’d love to try it. Me too! I love it when there are strawberries in my salads with balsamic dressing. will try this with my roommate soon! How fantastic! Washington strawberries are just about ready for picking. I must give this a try.